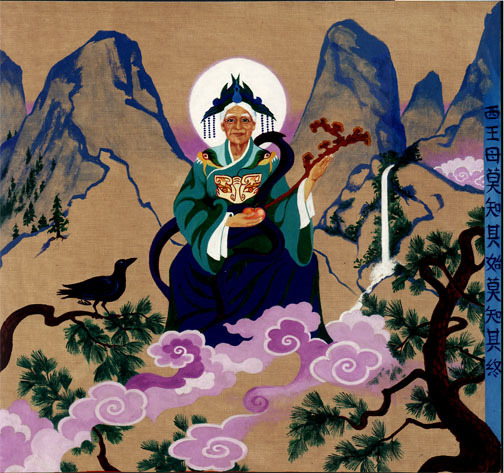 The Great Goddess of Taoists holds the sacred ling zhi fungus and one of her life-giving peaches. She wears the emblem of the White Tiger of the West, and is attended by the three-legged raven. She can also be seen accompanied by a nine-tailed fox, a seven-horned white stag, a dancing frog or the moon-hare pounding herbal elixir. causes and cures diseases, and imparts mystic wisdom. Energies of new growth surround her like a cloud. The name Xi Wang Mu means Queen Mother of the West, and can also be translated as Grandmother of the West. She is very ancient, as shown by a Shang dynasty oracle bone inscription refers to making "offering to the Eastern Mother and the Western Mother." and Earth, along which spirits and shamans travel. Xi Wang Mu is attended by a host of faeries and immortals. A three-legged raven is one of her magical emissaries.